In addition to the standard rifleman, members of the 3rd Rifle sometimes adopt secondary impressions to complement their primary rifleman impression. These can range from alternative combat troops such as combat engineers, to the support services like medical personnel. These alternative impressions are also useful at public displays to help educate the public on the various roles a soldier of the Red Army could perform. 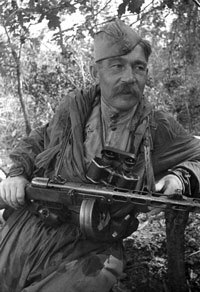 Always at the forefront of every major Soviet operation were the razvedchiki, the reconnaissance scouts of the Red Army. They were the elite d’corps of the Red Army, taking the role of both special forces and reconnaissance units. Every large infantry or armor force had a complement of scouts to help lead the rest of the unit in to combat. Scout units were well-equipped and often utilized special camouflage clothing to aid them in their role of discreet reconnoitering. 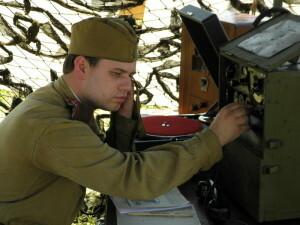 Scouts were the ubiquitous soldiers of the Red Army, fulfilling multiple roles that the other, more “modern” armies of the time period developed specific units for. They were often used in the gathering of information via observation, capturing ‘tongues’ (a Russian term for German prisoners) to interrogate for vital intelligence, or more conventionally combat roles, such as prowling and investigating the enemy’s defenses. In major attacks, the scouts were often used to find routes to the enemy and lead troops forward to open the battle.